In their debut live performance, Nihill bring their brutal and unforgiving black metal to 2013 Roadburn Afterburner on Sunday, April 21st at the 013 venue in Tilburg, Holland. 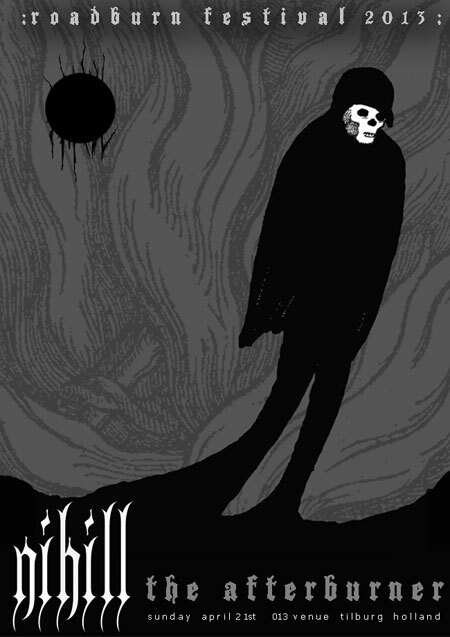 “Like fellow avant-garde black metal brutes Gnaw Their Tongues, Nihill craft corruptive suites that eschew any hooks or, at their best, any sense of predictable structure. Verdonkermaan‘s five lengthy songs buried hints of melody under waves of remorseless abrasiveness, with static-ridden riffs, frost-bitten feedback, distortion and drone smothering all. The album’s finest moments came when its raging pyres of chaos and cruelty overwhelmed with their intensity—misanthropic murderousness was heaped upon atonal annihilations till all became a singular blur of black-hearted nefariousness. The band clearly reveled in the demoniacal glee of elongated churns of depraved and discombobulating noise” — Craig Hayes / Popmatters. Tickets for the 2013 Afterburner are still available!